Baptisia (bap-tiz-ee-uh) False Indigo, Pea Family (Leguminosae); Vigorous, shrublike perennial native to the eastern half of the U.S. Leaflets of striking compound leaves are arranged in threes. There are many potential applications in the landscape including meadow plantings, as a backdrop in borders, or as a specimen. Though Baptisia is a large perennial, it can be grown in smaller gardens if maintained a bit differently. In early spring, set out a peony ring (circular wire stake) for the Baptisia to grow through. This will help it to grow more upright and take up less horizontal space. After the plant is finished blooming, prune it lightly throughout the season to keep its size in check. Seed pods may not develop in fall due to the pruning, but the flowers and foliage will be beautiful. Excellent as a border plant, in mass plantings, for cut flowers, specimen or focal point and its salt tolerant. They can be dried for use in arrangements. Attracts butterflies and Deer resistant. PLANTING: Set plants about 3 feet apart, Baptisia grows best in full sun, though it tolerates light shade. Baptisia is easily grown in poor to average, well-drained soil. 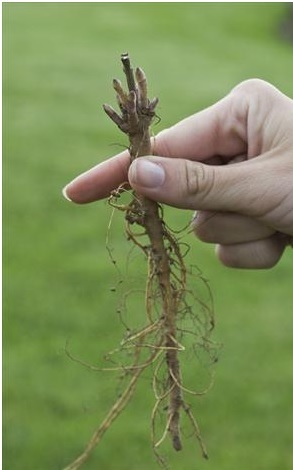 Choose your location carefully, as established plants put out extensive root systems and do not like to be moved. MAINTENANCE: Keep plants well-watered until established, after which time they are quite drought resistant. To dry the seedpods, cut them early in the fall before they become weathered and wrinkled. Keep them right side up in a dry, airy location until ready to use.